Forget the fact that it can be incredibly frustrating and result in even the most sophisticated man going into a profanity-laced tirade. Golf may be the greatest game ever to play with your kids. Why? Because it is full of metaphors that you can use to teach life lessons. Golf isn’t a game that I play often. Come to think of it, I haven’t played at all this year. 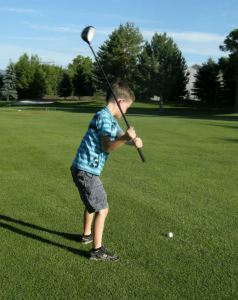 But as my boys get older, I will be getting them out on the links soon. And when I do, these are the lessons that I will teach them while we’re out there. If you’ve ever played golf, you know all about the first tee jitters. There you are, on the first tee box. Everyone, including the foursome of guys with the next tee time, is watching you. Quietly waiting for you to hit your ball. Tons of thoughts rush through your head. Regardless of the result, just getting the ball out there and off the first tee box is a big relief. From there on out, that nervous feeling you felt on your first shot is gone. Now you can just play. LIFE LESSON: If you have a goal you want to reach, the most difficult thing is taking that first step toward it. But once you do, you’ll feel a lot better. 8. Play it where it lies. You hit a beautiful tee shot that hugs the side of the fairway. At the last second it hits a slope and rolls just into the rough. When you walk up to your ball you discover that it’s in some pretty thick and tall grass. About 18 inches to the right is the fairway that looks like carpet. It would be so easy to play a little foot wedge here and get your ball into the fairway. But that’s not how the game works. You’ve got to roll with where your ball wound up and play it where it lies. Make the most of your situation. Hit the best shot you can and move on down the fairway toward the hole. LIFE LESSON: Sometimes life doesn’t work out the way you had hoped. You did everything you could have done, but the end result wasn’t what you were going for. Deal with it the best way you can and keep moving forward. 7. Don’t dwell on a bad shot. One or two bad shots won’t ruin a round of golf…unless you let them turn into a round full of them. Bad shots are going to happen during the course of 9 or 18 holes. How you handle them is what can make or break your score. When you hit a bad shot, think about what you did. Learn from it and move on. Don’t continue to beat yourself up over it. When you focus on one bad shot and allow it to anger you, it will affect your next shot, guaranteed. LIFE LESSON: Learn from your mistakes, but move on from them quickly. Don’t harp on negative outcomes in your life. 6. Learn to laugh at your bad shots. Pretend you just hit a beautiful tee shot. Now you’re standing in the middle of the fairway visualizing your approach shot. If you’re on the green in two you’ll be putting for birdie. There is nothing but a clean, clear 150 yard strip of fairway between your ball and the green. You approach the ball. Take one last deep breath…and proceed to shank the crap out of the ball, hitting a worm-burner into a bunker that is about 30 yards to the right and 75 yards short of the green. 1. You can curse and fire your club across the fairway and become very angry with yourself. 2. You can laugh at the ridiculously bad shot you just hit. LIFE LESSON: Don’t take yourself too seriously. If you beat yourself up after every screw up, soon you won’t have the courage to keep trying different things because you’ll be scared of failure. By learning to laugh at yourself when things don’t work out, you can move on quicker. Not to mention, life is a lot more fun when you laugh. Who wants to be angry all the time? 5. Don’t ever grab a crappy ball to hit it over the water hazard. Have you ever played with someone who puts their good ball into their pocket and pulls out a beat up range ball whenever they get to a water hole? Or do you do that? If you do, you’ve already put it into your mind that you’re going to hit it in the water. Think about how psychologically defeating that act is. Instead, teach your son to approach the situation with confidence. Use the best ball in your bag and say defiantly, “This baby is going across.” If you end up in the water anyway, so what? At least you went for it with confidence. Take your drop on the other side and keep moving forward. LIFE LESSON: Conquer obstacles with confidence. Just like your round of golf isn’t over if you hit one in the water, your quest for goals in life doesn’t end when you get dealt a setback…or twenty. Keep your head up. Hit your next shot, and get back into the game. I’m not a very good golfer. Why? I rarely play. I got respectable about 12 years ago when I played in a golf league once a week over the summer. Why? I was playing consistently. Therefor, my swing had some consistency to it. And when my swing got consistent, so did my rounds of golf. I didn’t see as many scorecards that were all over the place. I was putting in extra time at the range and in my backyard in between my league rounds. LIFE LESSON: If you want to constantly improve at anything, you have to consistently work at it. You can’t decide to work on it for two weeks, then take a few months off. Then work on it for a three weeks, then take another two months off. Even if you have a natural talent for something, if you don’t consistently use your talent, you will not have success. 3. Sometimes you get lucky. I’ve seen a ball skip five times across a lake and up onto the green. I’ve seen a ball snap, crackle and pop it’s way through trees only to shoot back out into the middle of the fairway. I’ve seen a ball over-shoot the green by 30 yards, hit off a big bolder and come back into play and onto the fringe of the green. If you’ve played golf a few times, I’m sure you’ve seen a few crazy lucky shots too. LIFE LESSON: Luck is unpredictable. It’s fun as heck to catch a lucky break or bounce, but you never know when luck will strike – so you can never rely on it. The only thing you can control is how hard you work and how badly you want success. 2. Know where you’re going. Have you ever been on a tee box and couldn’t see the green? What’s the first thing you did? Pulled out the scorecard and looked at the hole layout right? Why did you do that? Because you don’t want to just blindly hit the ball without first knowing which direction you need to be aiming for. Hitting it to the right on a dogleg left isn’t a good plan of action. LIFE LESSON: Set goals and keep your sites set on them. If you don’t know where you’re going, you’ll never get anywhere. 1. Playing it safe isn’t nearly as much fun as going for it. If you play it safe and hit lay-up shots nine times out of ten, how many times will you fondly look back at those nine safe shots? Never, right? Now, how many times will you replay, and talk about, that tenth shot when you went for it all and made an epic shot? A lot! LIFE LESSON: No one remembers the safe shots. Sometimes in life you have to go for it. Dream big and take your shots at greatness. The rewards are worth it. I thought of some other lessons, but I decided that nine was a nice golf number to end with. Let me know what other life lessons you’d like to teach your kids using golf as a metaphor. I hope that you will read this brief article on lessons golf will teach you. I think that just hitting balls will start working towards an activity that the two of you can do for a life time.